The position at which a soccer player becomes a specialist can often be determined by his physical height and stature. However, this is not always the case. A player who is strong and powerful will have different strengths and weaknesses compared to a player shorter in stature but also fast and nimble on his feet. A winning soccer team usually will be made up of a group of players performing to their strengths. An effective goalkeeper is agile and has quick reflexes. Goalkeepers are often tall to make it more difficult for an attacker to get the ball past them. They have the ability to jump high and stretch wide to stop shots and crosses. 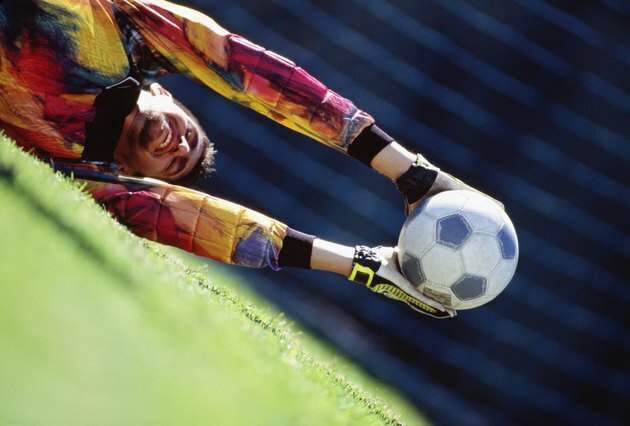 A goalkeeper's ball-handling is often his weakness as he does not practice it as much as other players. A defender must be skilled at tackling. There are three main types of tackles -- the jockey, the block and the sliding tackle. Bad timing of a tackle could result in being sent off, giving away a penalty or letting a player through on goal. Some defenders are not skilled at shooting or dribbling past opponents, but there are players who are exceptions, such as Barcelona's Dani Alves, an attacking defender. The midfielders are the workhorses of the team. They are good at winning tackles and can shoot and dribble past players. They are specialists at neither. A midfielder's main strengths are her ability to maintain possession of the ball and looking for passes that can start attacks. Different midfielders have different weaknesses. A central midfielder may lack pace, while a winger may be light and easily pushed off the ball. The primary role of the attacker, or striker, is to score goals. An attacker must be an accomplished shooter, whether it with his foot or head. A cool head in front of the goal can lead to a high-percentage shot. Attackers have to be able to score from unlikely positions. Many strikers are selfish in front of the goal. This can be a weakness as they do not spot teammates with better opportunities to score.